To switch from one mode to another, depending on what is desired in a particular or appropriate context. Flexibility and adaptability do not happen just by reacting fast to new information. They arise from mental and emotional balance, the lack of attachment to specific outcomes and putting care for self and others as a prime operation principle. Flexible attitudes build flexible physiology. Flexible physiology means more resilience in times of challenge or strain. Staying open -emotionally- insures flexibililty. By Doc Childre and Bruce Cryer, From Chaos to Cehoerence, n.d.
First of all you have to get aquatinted with the concept of flexibility; what is it and on what is it based. Secondly, you have to be aware of your own degree of flexibility towards lecturers and students in different situations you have to deal with. Third, flexibility should help you in your contact with lecturers and students from other countries and with another cultural background. To reach these goals, you read theory and articles about the concept behavioral flexibility, watch videos, carry out tests and assignments and discuss the outcome and cases with your peers. To get acquainted with the concept ‘flexibility’ you need to know what it is and what it is not. Read the text below and the literature recommended in the links. Furthermore, we like you to watch the video ‘Incompetent vs competent cultural care; diversity in nursing’. The articles and the video should help you to understand the concept of flexibility and how you can improve your flexibility in given situations. We all have predominant behaviors. It describes our ‘personality’: “She’s a real live wire.” “He’s a very quiet guy.” The problem is that we get comfortable with the behaviors we know well and don’t often try out different ways of behaving. Does this matter? Yes. It could be the reason why so many of us are stressed or anxious. It could explain why some people are less effective at their job than others or why some people have poor relationships or unfulfilling social lives. 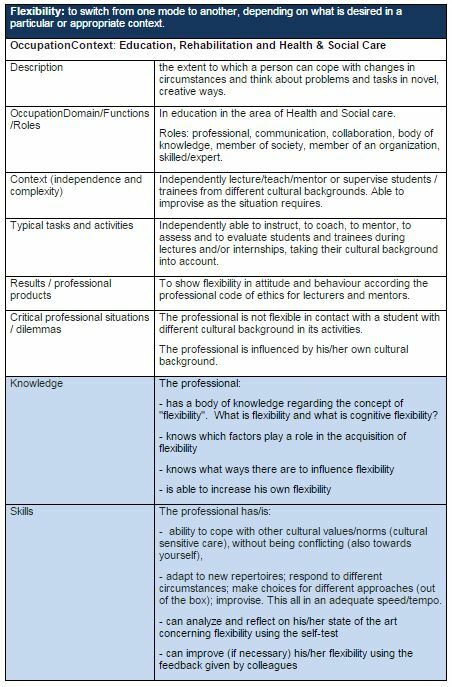 Flexibility lives in many parts of our social life, that’s why it is important to highlight this concept also in relation to international relationships at HEIs or workplaces. Behavioral flexibility describes our ability to ‘flex’ our core behaviors so that we respond to each circumstance in the most effective way. For example, a boss at work. A super-assertive leader who makes things happen. Drives the business. Wins the big battles. Assertiveness is great, right up until a key team member comes to them with a personal problem. Barking a solution doesn’t work. It feels uncaring to the employee and creates an instant problem that could have been avoided. Or someone who is quiet and dependable. Everything is neat and safe and accounted for, but actually they are quite lonely. They go out with a group of friends. There is someone they connect with, but they just can’t find the courage to ask them out for a coffee. A possible soul mate is missed because they couldn’t take a risk. Behavioral flexibility is about having both sides of the same behavior. So the assertive boss knows when to tone it down and tries less in-your-face behaviors to get better results. The wary person can take a controlled risk from time to time to enjoy a richer life1. Before you continue to explore the awareness of your own flexibility, through several assignments, watch the video: ‘Incompetent vs competent cultural care: Diversity in Nursing’. Watch this video especially from the perspective of ‘flexibility’. The assignment mentioned below must give you an insight in how flexible you are in given situations. Discussing the outcome with peers must lead to a better understanding/awareness about how you perform in a situation and how to improve it. In this module Flexibility you have 5 assignments. Read in this dissertation pages 13-19, pages 53-55, pages 88-89 (College Instructors’ Perceptions of Flexibility in Teaching) and 114-118 (Concepts of Effective Teaching and Flexibility in Teaching). Answer following questions. What is your concept of flexibility considering your job? Think about what you already do to be flexible and what still can be improved. Which parts of this article are an inspiration and why? Write down all the answers in max 200 words. Describe briefly a situation in which you experienced that you were not flexible in that particular situation. What made that you didn’t find yourself comfortable in the situation? What have you done till now to improve your flexibility in unknown situations? What could help you being more flexible in situations you described? Read the argumentation why good teaching doesn’t always require flexibility. Describe a specific situation in which good teaching might not require flexibility in max 200 words. Discuss with your peers what you think determines when flexibility is necessary for good teaching. Watch the video. Another way of flexibilityisgiven by teachers to students. What do you think of this flexibility, what are the advantages and disadvantages and is it possible to create this in your own classes? Describe your view.